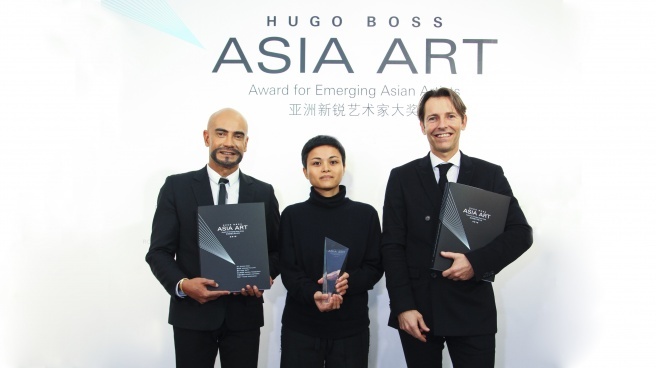 Larys Frogier, Director of the Rockbund Art Museum (RAM), and Marc Le Mat, Managing Director of HUGO BOSS CHINA RETAIL CO. LTD, announced today that Maria Taniguchi has been awarded the HUGO BOSS ASIA ART Award for Emerging Asian Artists 2015. Maria Taniguchi (b. 1981, Philippines) was selected from six nominated artists: Guan Xiao (Mainland China), Huang Po-Chih (Taiwan), Moe Satt (Myanmar), Vandy Rattana (Cambodia), and Yang Xinguang (Mainland China), whose works are displayed at RAM from October 30, 2015 to January 3, 2016. Larys Frogier, Chair of the HUGO BOSS ASIA ART jury, said: "With the precious contribution of the HUGO BOSS ASIA ART 2015 jury members, we are extremely proud to award the female artist Maria Taniguchi from Manila, Philippines. Her very singular, humble, but extremely focused practice of painting and video enriched the realm of media and raised a unique sensitivity of making the picture with infinite possibilities of meaning." Maria Taniguchi was born in 1981 in Dumaguete, Philippines. She lives and works in Manila, Philippines. Throughout her paintings, sculptures, and videos, her work involves a determination for form. Maria Taniguchi’s voluminous brick paintings employ rigorous composition and monochromic techniques, with a dense investment of time and labour which is transformed into a visual spectacle. Her sculptures establish a tangible system in space, as well as an order and logic of viewing and participation. The manipulation of the camera and the status and movement of the objects in her video works also brings about consistent rhythms and patterns. With such logics and patterns, Maria Taniguchi unpacks knowledge and experience — connecting material culture, technology, and natural evolution — and investigates space and time, along with social and historical contexts. The artist finds herself in the exhausted socio-political situation and economic structure amid the reality of the Philippines, and projects this constant experience onto her works. “Her never ending development of brick paintings engages subtle dialogues and blurs the frontiers with sculpture, architecture, installation, offering the spectators a powerful experience of the physical, the geo-political and the mental limitations/extensions of the inside-out space/time representations. Her detailed video compositions of objects, architectonic elements, and color spectrums turn out the repetition and the familiar into a full practice of difference and strangeness. Maria Taniguchi solidly positions her work, without any compromise, into the context of Asia and international contemporary art. ”commented Larys Frogier.